Features - fashion canvas travel duffel bag perfect for everyday use, with all your daily bits. 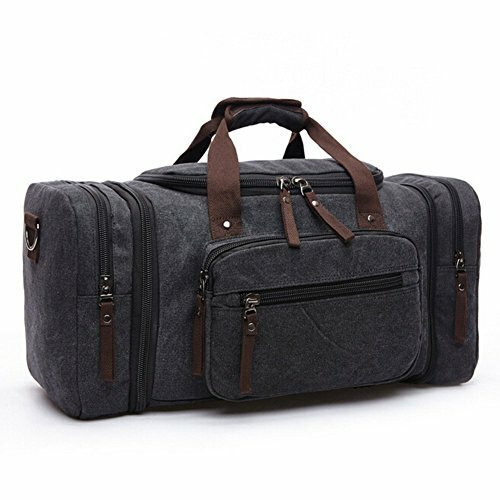 This cool large weekend travel bag works well with a variety of different outfits and casual styles. A great gift choice, it's fit for outdoor, travel, shopping, beach, school. Fashion vintage design, well sewn craftsmanship. Measurements - size: 53cm (l) x 30cm (h) x 25cm (w)/ 20.8'' (l) x 11.8'' (h) x 9.8'' (w) structure - gender: Men - closure type: Zipper style: Fashion main material: Canvas washing instructions: Hand wash with cold water. Hang to dry. Washing separately to avoid staining. Package includes: - 1 x bag only purchasing notes: 1-2 cm error of measuring is a reasonable range due to different measurement methods. - It's can't avoidable that you will receive the bag with some smells from original material as it's brand new. - The smell will be gone if place the bag in freely circulating air for 2-5 days. If you have any questions about this product by Toupons, contact us by completing and submitting the form below. If you are looking for a specif part number, please include it with your message.